Unbelievable but true! Only €29/£26 per person for a 24 hour return crossing as a foot passenger including a cabin? For a limited period until the end of January on selected dates take advantage of this amazing offer. You can also give this as a Christmas gift to your loved ones by simply contacting Fastnet Line. We will send you our special Christmas voucher so that you can surprise someone you love with a great trip on the Julia. This offer is valid for travel until the 31st January 2011 on selected dates and is subject to availability. You must book by the 15th December to avail of this great offer. We recently got some great feedback from our neighbours in the National Maritime College of Ireland who had some recent participants in their BOSIET and offshore courses use the service and save some money. Fastnet Line continues to be one of the most progressive ferry companies on the Irish sea. On Monday, its owners the West Cork tourism Co-Op will open their Tourist Information Office on board the MV Julia. The large space located on deck five is dedicated to giving passengers as much information as possible about the destinations on both sides of the Irish sea. The shareholders who have invested €3m of their own money to purchase the ferry and establish Fastnet Line will now be able to display information about their businesses to the tourists travelling on board in what is believed to be a unique venture on any ferry to southern Ireland. Only businesses which have invested to become members of the Co-Op are allowed to display on board the ship. Shareholders also benefit from joint marketing opportunities with Fastnet Line which should enhance their opportunities to gain additional tourist traffic. The tourist information office consists of large scale grpahic representations of Wales and Ireland as well as a central information desk and leaflet display racks. the office will be manned by trained staff in high season who will be able to give detailed information about the two destinations as well as advice regarding shareholders offerings. West Cork Tourism Co-Op membership is still open to businesses in Ireland and Wales. For some years now, The Heineken Cup has had pride of place in European rugby union and our own Irish province of Munster has excelled in the competition: French teams have dominated recent events but Munster won the cup in 2006 and 2008. The Munster club prize the cup very highly among the silverware available to them each season. I must admit that when the Cup pool draw was announced this summer, it was hard to contain feelings of amazement and pleasure at the draw: The tournament organisers appear to have had a central role in mind for Fastnet Line to play in connecting three teams from England, Wales and Ireland. The rugby clubs of London Irish (Reading), Ospreys (Swansea) and Munster (Limerick via Cork) seemed to all have been strung along an East-West axis from the UK’s M4 Motorway – over the Irish sea to the Munster ground. The French team, Toulon, is the exception – but also boast a host of international stars not least World Cup winner, with England, Johnny Wilkinson. Munster of course comprises much more than Cork. The rugby team play out of Thomond Park, Limerick in a revamped stadium and the Munster following are numerous, loyal, and travel extensively. 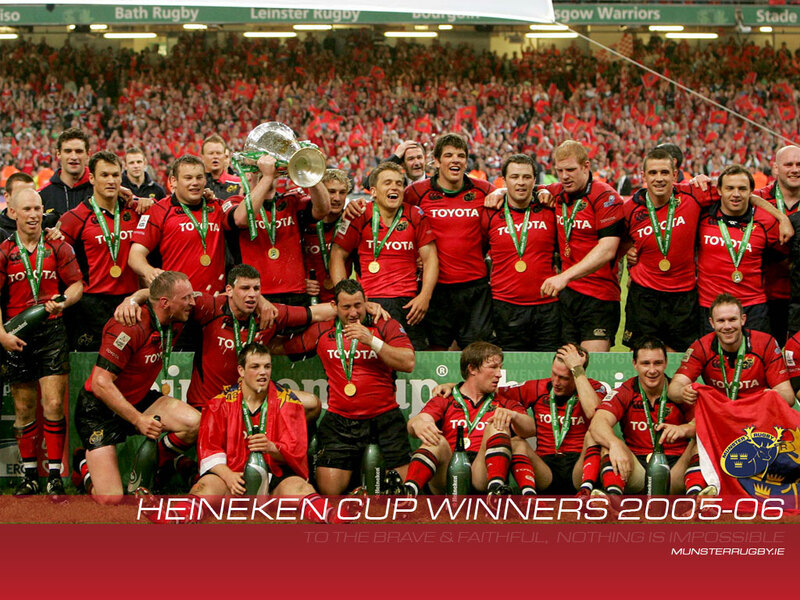 Games involving Munster hold several Heineken Cup records for attendance in every stage of the competition, including the finals. To say the least, this first part of the competition will be extremely feisty on the field and very enjoyable off it. Needless to say, all of us at Fastnet Line are really looking forward to catering to the rugby crowd – and encouraging them to make full use of us around the Cup fixtures. Anyone who knows the rugby scene well, appreciates that rugby people generally bring colour, vitality and commerce to every occasion and city that they visit and this will certainly be the case when Munster travel to Ospreys in Swansea on the 18th December. We expect a bumper crowd to travel on a rugby special to Swansea on Friday 17th December and to travel back with on Saturday night 18th December after the game. What is sure is that win or lose, the atmosphere will be terrific and the singing mighty! We can’t wait! Visit Ireland, England or Wales, by sea on The Julia, this coming May & June on the Swansea to Cork or Cork to Swansea Route, by Fastnet Line and extra passengers can travel FREE! Prices start from £89/€99 each way Sunday to Thursday and Friday/Saturday from £99/€109 for a car & driver and 2nd passenger travels free. Read more on this Ferry Special Offer.